Aired: Apr 2, 2016 to ? Based on the original comic BONO BONO by Mikio Igarashi that has seen over 9,000,000 total copies printed, this is the definitive animated version of the emotionally soothing character-driven series that will make you ask yourself the philosophical question, "What are living things?" while laughing at heartwarming gags and being entertained by the interactions of amusing forest friends Bonobono the young sea otter, Chipmunk, Fishing Cat, and more. Enjoy the easygoing days and minor misadventures of Bonobono and his friends! Bonobono is an anime short that is focused on the lives of a few animals. Each episode is about five and a half minutes long, and the cast of characters is fairly small. Bonobono originally aired in the 90s, and this is the 2016 take on the show. To be clear, I have not seen the original so this review is just based on the 2016 version. While some episodes do continue on into the next one or reference each other, the story is for the most part not exactly fluid. Each episode is extremely mellow, and shows us Bonobono (the blue sea otter guy in the picture) living a peaceful life with his animal friends and father. There's a chipmunk, a racoon, and more. Even though Bonobono's life is peaceful, him and his friends seem to wonder about strange things and often find themselves looking for answers to the many questions of life. The sound for this show is something that I imagine is not for everyone. Bonobono's voice actor and the rest of the cast fit perfectly in my opinion, but I could see some people being turned off by Bonobono and his father's voices in particular. They almost seem kind of... slow... The background music is again, very mellow, but perfectly fitting in my opinion. The ED is great as well, it always gets stuck in my head. Each character in Bonobono is unique and clueless in their own way. They rely on each other to try and answer their many curiosities. The show is comical in this way, as sometimes the "conclusions" they come to based off of their friends' information are quite ridiculous. It is definitely dry humor, and will probably make you shake your head a few times. I like the art for this show because it is simple and represents the show perfectly. Everything about this show is simple, but rightfully so. The episodes are a perfect time length, and I really enjoy this show every week. I don't foresee this changing, and if you have seen the show you would know why. You kind of know what to expect each week with this show. Not in terms of story, but what kind of show you are going to get. It has not changed in 22 episodes and is successfully heartwarming each time I watch it. Give this show a shot, as I am not sure why it has such a low rating on here. It's only 5.5 minutes and definitely worth it. It's been a decent year for anthropomorphic animals in TV animé. 2016 saw the CGI enhanced return of Chi's Sweet Adventure; the unique side scrolling comedy Sengoku Wildlife Caricatures; & the charmingly oddball CG-live action hybrid Nyanbo – probably as close as we'll get to a Yostuba&! adaptation. Quietly running throughout 2016 & still ongoing, though, was the return of an even older series, Mikio Igarashi's BonoBono. 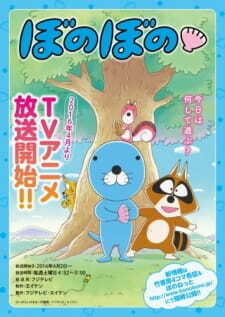 Consisting of fifty, five minute vignettes, the first season follows the relaxing, amusing & often meandering days of the titular blue otter. Laid back, absent minded & always holding a clamshell, it doesn't take much for Bono to find pleasures in the simple things or have his mind fired, or distracted by, the most mundane or unusual occurrences. Imagine if Osaka from Azumanga Daioh got lost in the forest. Rarely able to answer his own questions, Bono's woodland wanders are often accompanied by the brash yet earnest Raccoon (not a Tanuki!) & the adorably cynical Chipmunk. Though often of little help, they make for entertaining company, the trio having echoes of Pooh, Piglet & Tigger from Winnie the Pooh. A strong recurring support cast further add to the series – my favourites being Bono's lackadaisical father & Chipmonk's sisters. Accompanying the entertaining characters is a commendable production from director Hidenori Yamaguchi & studio Eiken. The series maintains a consistently mellow pacing, resisting the possible temptation to heighten the emotion of scenes or overindulge in giffable character reactions. The only thing that might seem odd at first is the characters tendency to switch between using conventional mouth flaps & something that looks more like the trumpet mouths in Pingu. A bright yet soft colour palette more akin to children's illustration than typical TV anime further adds to the relaxed mood, as does the music. It's hard to resist the urge to hum or whistle along to Moonbright's theme song. It's not all smooth sailing, though. As fun as the main trio can be, their shtick can get old. Raccoon often fills the role of tsukkomi, which means lots of hitting & shouting at other characters. An otherwise fun character, it's unfortunate that arguably he's at his weakest when purposely trying to be funny. Chipmunk, while their cynicism & occasional sinister turns are adorable, also has “are you going to bully me?” for a catchphrase, repeated ad nauseum in some episodes. There is also a lot of toilet humour, which is fine but there is only so many times you can laugh at poo. Then again, Bono Bono isn't a series that's really meant to be binged, which is when the more repetitive elements of its humour become obvious. While not quite as episodic as it appears, with many vignettes being paired by theme or characters if not direct continuations, none the less it's arguably best enjoyed a few episodes at a time. Its laid back atmosphere & quietly comic musing on the big issues (to a small animal) make for a great visual palette cleanser to relax & clear the mind - or maybe even get you thinking yourself. Made for children but enjoyable by all, Bono Bono is the kind of laid back, family friendly TV that one sometimes wishes there was more of. Pleasantly relaxing & often amusing, if you're looking for an anthropomorphic alternative to the usual anime fare, you'll find it here.